Oh dear. I did not respond. I think he's a little off his rocker. On a completely unrelated note, I have at least a dozen yards of bubble wrap left over from the stuff my mom sent me. Would anyone like it? 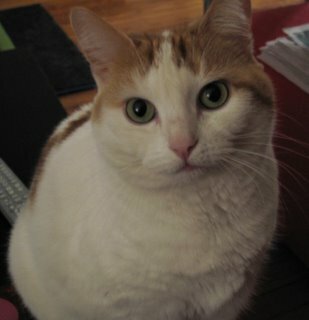 And, on another unrelated note, would anyone like to board the cutest kitty in the world for twelve days in March (16-28)? I'm going to Israel (more details on that later) and Miss Tabitha needs a place to stay. She is a mouser, and generally friendly and easy going. She has proved able to get along with other cats and I suspect would be fine with other pets as well. Drop me a line and we can figure out the details.